Amanda Charchian (b. 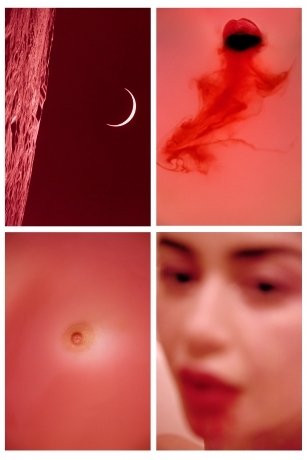 Los Angeles, CA, 1988) creates work with a feminine sensuality that celebrates the erotically charged. Amanda earned a BFA from Otis College of Art and Design in 2010, and has been featured in publications such as New York Magazine, Vogue Italia, TIME, The Huffington Post, Interview Magazine, L’Officiel ART, i-D, Purple, and Turkish Vogue. In 2016 Charchian released her first monograph, Pheromone Hotbox featuring works captured over three years. Charchian has produced editorial and commercial work for Gucci, Chloe, Cartier, Garage, and Vogue Italia. Amanda Charchian lives and works between Los Angeles and London. "This quadriptych features four photographs from my “Seven Types of Love” series that aims to encapsulate the feeling of Agape, an ancient Greek word which describes a saintly, spiritual and altruistic love. As opposed to the other types (Ludus, Storge, Philautia, Eros, Pragma and Mania) included in the series.